There's something fishy about this game! 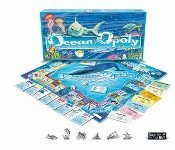 Oceanopoly is based on the beautiful, bizarre and fascinating world of the ocean. Buy your favorite sea creatures. Raise the rent by collecting Blocks of Water and trading them in for a Big Fish! Every deed is filled with fun facts about each ocean creature featured on the board. So grab your token and advance to SPLASH! Who knows-you may be elected Top Tuna of the Sea...or you may be bellyaching from too much seaweed salad! Whatever happens...it's an ocean adventure that will tickle your gills! For 2-6 players, ages 8 to adult.